Barack Obama campaigned for president on a platform of change. As his disastrous tenure comes to an end, there’s no denying America has changed, and that Americans aren’t happy with the changes that Obama forced upon a reluctant nation. One of the most profound changes that has occurred is in America’s religious practices. 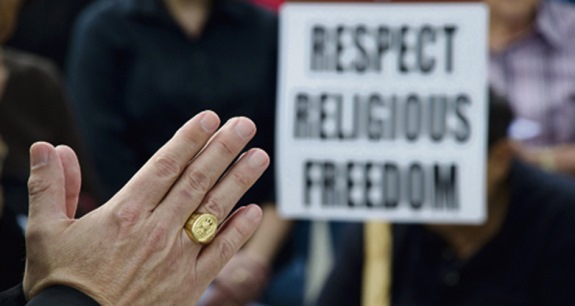 However, according to the Pew Research Center, when it comes to the nation’s religious identity, the biggest trend during Obama’s presidency is the rise of those who claim no religion at all. Those who self-identify as atheists or agnostics, as well as those who say their religion is “nothing in particular,” now make up nearly a quarter of the U.S. adult population, up from 16% in 2007. Due largely to the growth of those who don’t identify with any religion, the shares of Americans who say they believe in God, consider religion to be very important in their lives, say they pray daily and say they attend religious services at least monthly have all ticked downward in recent years. While the drop in Christian affiliation is particularly pronounced among young adults, it is occurring among Americans of all ages. The same trends are seen among whites, blacks and Latinos; among both college graduates and adults with only a high school education; and among women as well as men, according to Pew. The major 2014 survey of more than 35,000 Americans by the Pew Research Center finds that the percentage of adults (ages 18 and older) who describe themselves as Christians has dropped by nearly eight percentage points in just seven years, from 78.4% in an equally massive Pew Research survey in 2007 to 70.6% in 2014. Over the same period, the percentage of Americans who are religiously unaffiliated – describing themselves as atheist, agnostic or “nothing in particular” – jumped more than six points, from 16.1% to 22.8%. And the share of Americans who identify with non-Christian faiths also has inched up, rising 1.2 percentage points, from 4.7% in 2007 to 5.9% in 2014. Growth has been especially great among Muslims and Hindus, albeit from a very low base. However, here’s another much more encouraging Obama-driven trend revealed in a recent Marist poll. While Republicans were the most likely (66 percent) to see the issue as one of immediate importance, the poll, which was commissioned by the Knights of Columbus, found that 55 percent of Democrats and 51 percent of Independents agreed. By 12 percentage points, a majority of Americans (52 percent versus 40 percent) want the court to interpret the Constitution "as it was originally written" and not on what they think the "Constitution means now." Independents agree (50 percent to 42 percent), as do Republicans (78 percent to 18 percent). However, only three in 10 Democrats share this opinion (31 percent), and about six in 10 do not (59 percent). What’s our take on that surprising finding? While the biggest trend during Obama’s presidency is the rise of those who claim no religion at all, and while Christianity and individual Christians have been under attack by Obama and his Far-Left progressive allies, making Christian religious practice a dangerous choice, we are encouraged that in the waning days of Obama’s presidency the vast majority of Americans reject the idea that government can supersede the tenets of one’s faith. Submitted by email_registrat... on Fri, 01/13/2017 - 17:36. I see the downward spiral where people adopt Satan's dream of wealth, power, fame luxurious living and instant gratification of every lust and desire at the cost of character, oath of office, integrity honor, reputation, family, and Biblical principles and tenets as the worst trend to date. Turn that around and the other problems go away. Submitted by email_registrat... on Fri, 01/13/2017 - 16:58. Sadly, the current regime and its various regulatory agencies and judicial branches believe they have the right to override our 1st Amendment rights, and the laws of Yhwh God Himself, as well; to force our compliance with their very unhealthy and sinful beliefs. We were warned the day would come when truth would be exchanged for lies; and it's here today! It puts us in the position of having to choose, as Joshua challenged the children of Israel, whom we will serve. Will it be Yhwh God or government? I choose Yhwh God. Who do you choose? Submitted by cPW69zNBm2 on Fri, 01/13/2017 - 13:06. What utter nonsense. In my town (43220) look it up there's a church, it seem on every other block. Turn on TV many, many religious channels. What are ou complaining about?